Most girls seldom have good control over their mind. A girl should not only have a mind but a sound mind, to enable her make right decisions. A lot of women definitely have an attitude. For instance: A woman seeing another woman as a threat, an extreme feminist, a female chauvinist, a woman who snobs, and so on.It could happen contrariwise. Attitude can either be good, bad, ugly,positive or negative. (Oxford dictionary) A woman must decide wisely on what path she is to follow. Being classy could mean any of the following: stylish, high-class, superior, exclusive, chic, elegant, smart, sophisticated, fancy; expensive; upmarket; high-toned, upscale. Looking expensive and all in the absence of a sound mind with a bad, negative and ugly attitude would never allow anyone see you as 'classy'. Your oxygen could be expensive, it won't still change the fact that your attitude and mind needs restructuring. 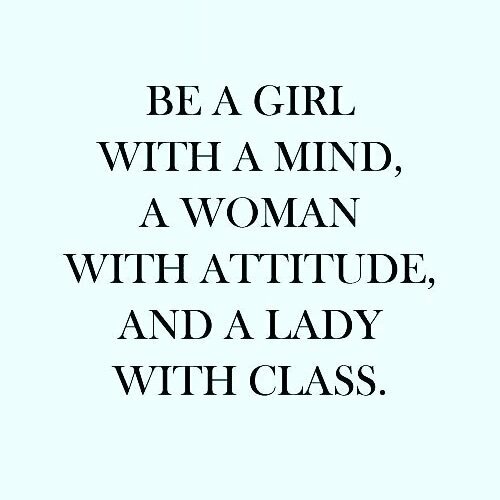 The saying "Be a girl with a mind, a woman with attitude and a lady with class" brings to our notice that an average woman has girly, womanly and ladylike traits ; all interwoven. No one is perfect, but we won't stop trying to bring out the best in us. P.S. This also applies to men. I Appreciate and Read all Comments! If this post is valuable to you; Please Upvote, Resteem and Comment. Click on any badge to view your Board of Honor. @Chinwengozi, thank you for using the naijapidgin tag. We encourage and support minnows. Join us on discord: https://discord.gg/5SR8CH4 for more fun and to submit your posts for curation.